Restoration of the south façade. The south façade photographed in c.1898. The areas highlighted in red date from the 1590’s improvements to the old manor. The blue outlined addition to the right was probably added by the architect Francis Cartwright of Blandford in 1754, and includes a classical mid-eighteenth-century room with a high ceiling and florally decorated plaster cornice. Originally built with Georgian sash windows, this corner addition was transformed shortly before 1908, when Tudor-style gables were added to the south and east corners (see third image) and the Georgian windows on the east side were removed and replaced with sixteenth-century style stone mullions. A gabled loft space with window was also added to the east; externally this has the appearance of an extra full floor but was never in fact converted for habitable use. The green highlighted buildings to the left date from the sixteenth and seventeenth centuries. The south façade being restored in 2016. The south east corner, covering the same area highlighted in blue in the first photo. The gabled additions of c.1900 included a gable with chimney to the south and dormer window to the east. The original eighteenth-century wooden roof structure was left inside, though structurally now redundant. The gable was built more for aesthetics than strength and with the addition of the oversized chimney topping in c.1927 a full structural strengthening and repair became inevitable as the chimney canted over precipitously. By 1908 this new ‘Tudorised’ gable end also had the addition of a new fireplace on the ground floor within what was previously the central open Georgian archway. By the end of the 1920s the top of this thin chimney had the addition of oversized and more elaborate brickwork protruding above the roof apex to match the new chimneys elsewhere within the Tudor manor. It can be seen as clearly different brick in the above photo. Unfortunately this large blob of 1920s redbrick was too heavy and large to be supported by the gable below and as such was close to collapsing onto the house by 2014. Sedgemoor Council issued an immediate allowance to remove this later chimney before disaster struck. By the removal of this carbuncle the opening up of the Georgian arches become possible, thereby preserving the best of both the Georgian and Edwardian additions to this area of the house. The chimney had caused so much damage to the gable that it needed to be fully rebuilt and will once again have a chimney capping its apex. However this chimney will be more in keeping with the gables proportions, supporting as it does only the Georgian fireplace in the first floor room. By working with the building as it existed by the Edwardian era, we intend to highlight the Tudor Manor House’s historic phases and pick out its most interesting details. To this end the garden immediately in front of the south façade will be laid out using original Tudor garden designs, which will architecturally reflect the building behind it. 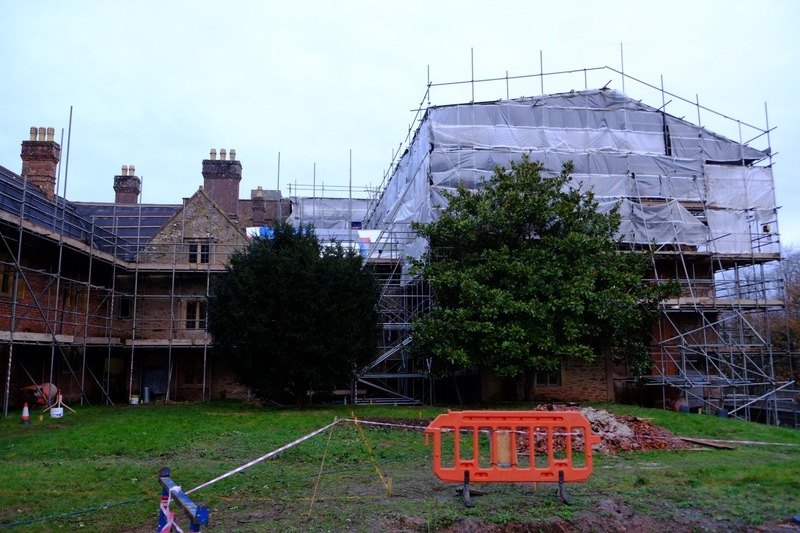 By subtly bringing back into focus the south façade, framed by its two original Tudor projecting gable ends, the sixteenth-century view of the old manor from this angle will be restored. During the 1920s the sash windows that had been installed during the eighteenth century were removed and replaced with stone mullion windows, as they would have existed between the sixteenth to the eighteenth centuries. Making such fundamental changes these days would be next to impossible, rightly seen by heritage bodies as removing honest architectural development within a country house. However as these changes were already executed nearly 100 years ago the restoration of the Tudor appearance of the south façade is now very much within grasp, through careful restoration of existing fabric and clever garden design. 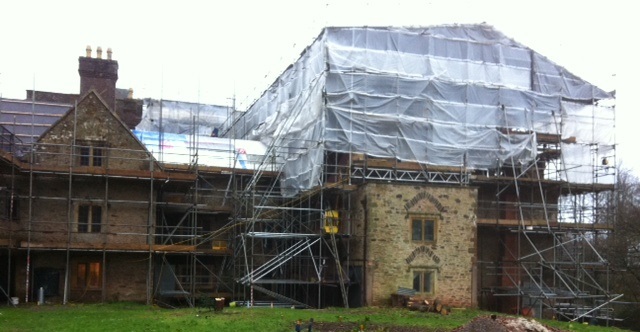 The south façade in late 2015, covered in scaffolding to repair and restore the roof and stonework. This image was taken before the removal of the incorrectly placed bushes and trees that hid the old manor from view and natural light. The structurally unsound south east gable, built c.1900 was in danger of collapse without this full rebuilding using the original materials. 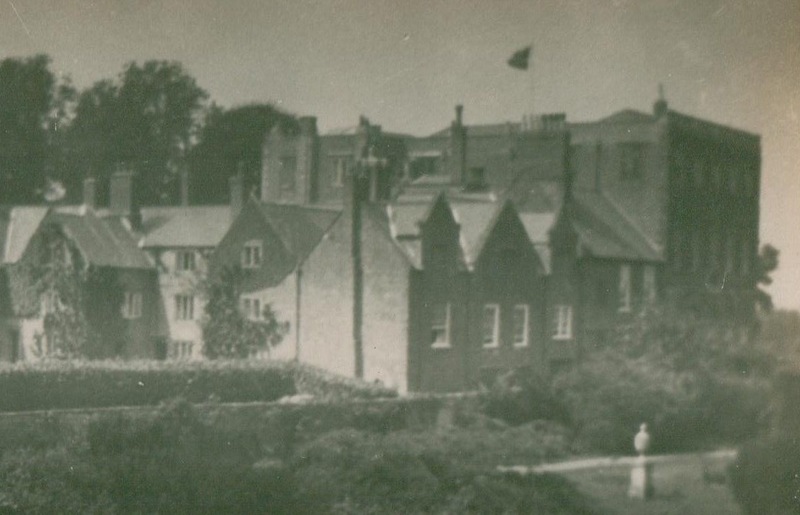 The old manor of Halswell from the south east, c.1900, photographed before the eighteenth-century sash windows on the east side were removed and replaced with more original sixteenth-century mullion windows. The south and east façade of the old manor of Halswell seen in the image above, this gives the closest indication of how the manor’s south side appeared in the 1590s. By the estate break-up in 1950, this important façade had been scarred by a large flat-roofed porch, a metal fire escape from the first floor and ownership subdivisions that hastened the south sides move away from being part of the historic manor and toward a forgotten service wing. 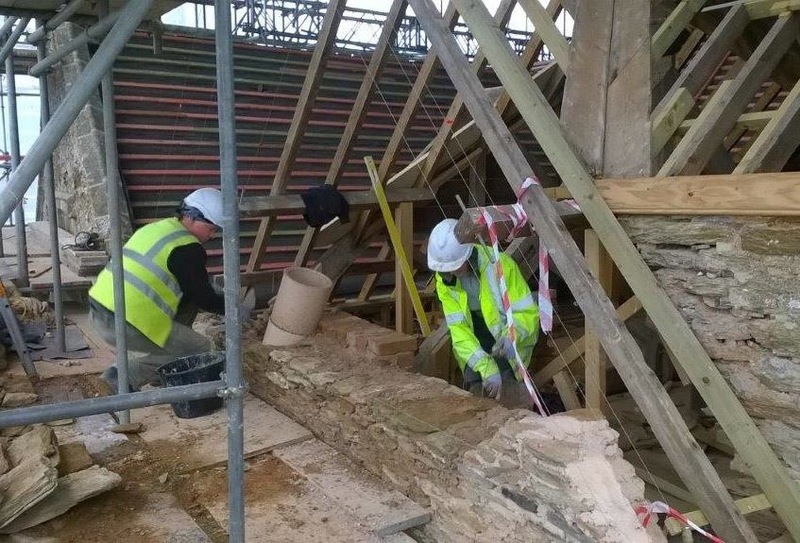 The current restoration of the stonework, windows, historic beams and woodwork as well as the insulation and re-roofing of the area is the start of bringing this historic aspect of the manor back to life. By restoring the old grinning plaster finish, which once covered the walls of this building the south façade with its two symmetrical gabled towers will regain the visual impact of the old manor. With the support of a Tudor knot garden that respects the proportions of the building the rebirth of the Tudor Manor’s southern exterior, after centuries of neglect, will be complete. Wonderful work, but I am a bit confused. Is it possible to post a photo of what this elevation looks like after the scaffolding and trees have been removed? I can’t tell which is North, South East or West from the photos provided, so don’t know where the South East gable with its chimney stack is. Dear Mick, I’m glad you are following it so closely. The area in blue on the first Victorian photo is the area that the gets the new c. 1900 gable with chimney added. The last Victorian photo from the south east shows the building and its new gable without trees or scaffolding, which might help you get your bearings. 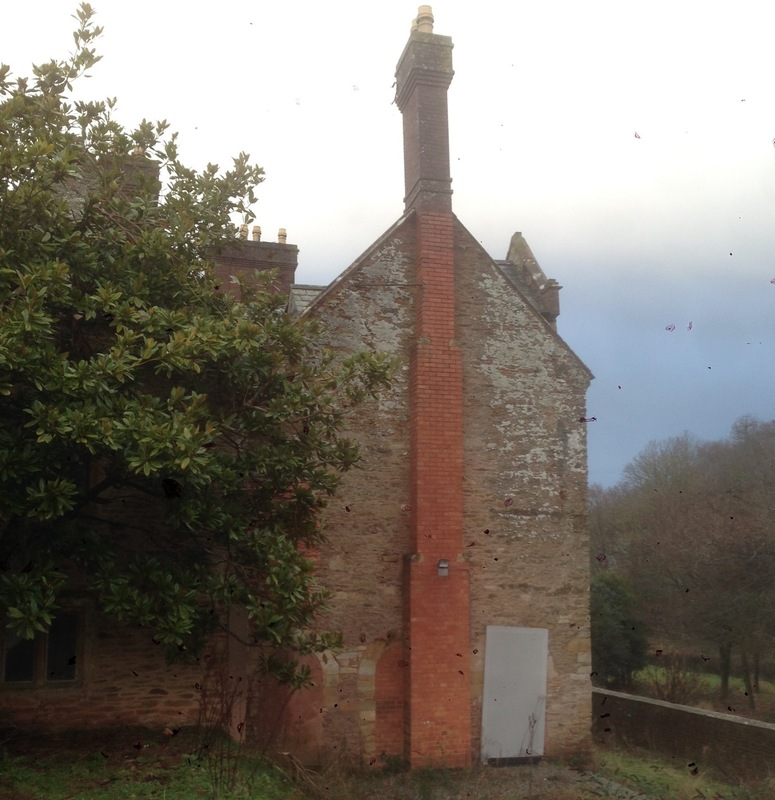 The recent photos in between are all the south range with and without trees – but all with scaffolding – including a close-up of the c. 1900 south east gable and chimney. I hope that makes things clearer.